The Italian motorcycle manufacturer, Moto Guzzi, built their first prototypes in 1920, with production starting in 1921. Since then, every type and style of two-wheeled transport has been made, including mopeds, scooters, commuters, cruisers, tourers and sports bikes. Although the company has changed hands a number of times, the original factory at Mandello del Lario continues to produce iconic machines, focusing on large capacity models with V-twin engines fitted across the frame. Ducati, Harley Davidson and many others make V-twins, but these are in-line models, where one cylinder sits behind the other. 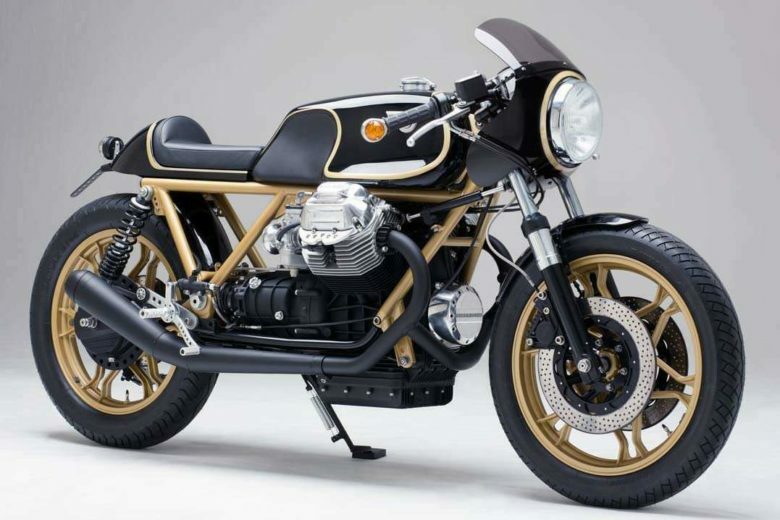 In recent history only Honda, in the late ’70’s, copied Guzzi with their transverse engined CX500 and CX650 bikes. In the 1970’s, Guzzi’s racing V-twins performed well in 24hr races, the best known being at Le Mans, France. When production of a sporting road bike started, it capitalised on those successes by taking it’s name from that famous racetrack. In the descriptions of the models below, production dates and numbers have been taken from Ian Falloon’s book ‘The Moto Guzzi Story’. The ‘Illustrated Moto Guzzi Buyers Guide’ by Mick Walker rates this as the most collectable of the series. Although called an 850, a look at the workshop manual specifies the engine as 844cc. Nevertheless, it was enough, when combined with its light weight, to make it one of the fastest production motorcycles of the era. Distinctive features, for a sports bike, was shaft drive to the rear wheel and linked brakes, where the foot pedal applied pressure to a disc on the front wheel as well as the rear. The hand brake squeezed the pads on a separate front wheel disc. Although electronic ignition had been around for a number of years, Guzzi used a pair of traditional contact breakers to generate the sparks. Likewise, each cylinder had its own carburettor. Cosmetically, the saddle was designed primarily for the rider, pillion passengers perching uncomfortably on the raised rear area. The fairing was minimal, doing little more than surround the headlight. But for some batches, build quality was suspect and the customer’s initial euphoria faded as rust on the exhaust and frame appeared, along with a disintegrating saddle. Primarily, the changes were mainly cosmetic; a new and better-made saddle made life more comfortable for pillion passengers, and a bigger, squarer, fairing provided more weather protection. Some might argue that this makes the styling look more touring than sports. Top speed performance suffered due to these changes. Contemporary road test reports suggest a drop of about 6mph with Motociclismo in February 1979 getting 126.5mph from the Mk II compared to the Bike test in August 1976 showing 132.15mph from the earlier model. Towards the end of the production run, changes were made to front and rear suspension, and engine cylinder bores received a Nigusil coating in place of cast iron liners. (Nigusil is Guzzi’s version of Nikasil, a hard coating of nickel that protects the soft alloy of the cylinder bore.) Failure to meet emission regulations stopped exports reaching the USA. In its place was a CX100 (some publications call it a CX1000) model featuring the engine from the Spada 1000. Only 353 were made, making this bike a rare sight. There are many differences between this and the earlier model. The fairing was re-styled, retaining the still fashionable sharp creases to the upper parts, but losing the shroud below the cylinders. Internal re-engineering of the cylinder heads now ensured compliance with USA emission regulations, allowing exports to resume. The effect, externally, was a more square shape to the heads and cylinders. There were many other changes to the cycle parts, including a new frame incorporating a crankcase breather. The swing-arm was also longer. More Mk III’s were made than any other version. While the original Le Mans is the most sought after, this version is perhaps the most solid. Overlapping the end of the Mk III production run was the Le Mans 1000. As the name implies, the engine was bigger; a glance at the workshop manual shows the size went to 949cc by increasing the bore diameter. Other engine changes included larger inlet/exhaust valves, and the racing-kit camshaft became a standard fitment. Different carburettors were fitted and this created much moaning from riders; strong return springs meant the throttle was very heavy. Personally, I’ve got hardened to it, but some people carry out modifications to ease the aching wrist. Owning a Moto Guzzi Le Mans 1000 and Moto Guzzi Le Mans 1000 Servicing Information has more on the practicalities of this model. While the engine specification remained unchanged, other modifications were made during the life of the model. Most people call the ’84 – ’88 models the Mk IV and the late ’88 – ’93 bikes the Mk V, although this was never official Guzzi policy. When first launched, a sixteen inch wheel was fitted, purely for cosmetic reasons, destroying the Guzzi reputation for competent handling. The reversion to the eighteen inch wheel in 1988 is generally considered to separate the Mk IV and the Mk V. Other changes tended to be cosmetic; for example the angular fairing still fitted in 1988 gave way to a more rounded shape in the final models. In 1976, the Le Mans was one of the fastest bikes you could buy. By 1993, it was still mechanically like a 1976 bike and riders now looked to others for fast transport. Honda had launched their 900cc Fireblade the previous year, which was faster, lighter, more powerful, and just more modern. Guzzi, helped by major financial investment, continue to produce bikes, and the Le Mans name is intermittently appended to their 1100 sports offering, but they are very different to those produced from 1976 to 1993.